BEIJING — The United States will not ease sanctions against North Korea until it denuclearizes, Secretary of State Mike Pompeo said Thursday, as he reassured key Asian allies that President Donald Trump had not backed down on Pyongyang’s weapons program. 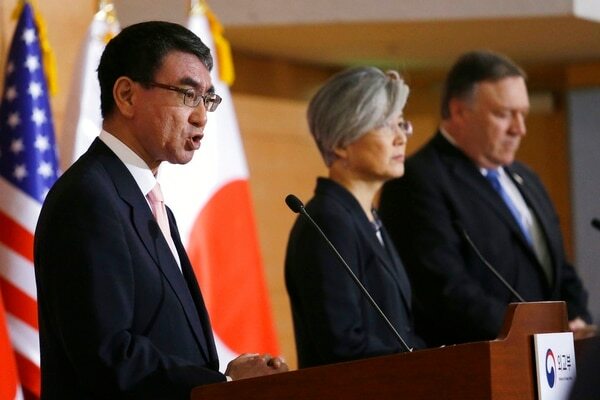 Pompeo, meeting in Seoul with top South Korean and Japanese diplomats, put a more sober spin on Trump’s summit with North Korean leader Kim Jong Un after the president’s comments fueled unease in Washington, Tokyo and Seoul. He said Trump’s curious claim that the North’s nuclear threat was over was issued with “eyes wide open,” and brushed off a North Korean state media report suggesting Trump would grant concessions even before the North fully rids itself of nuclear weapons. Trump returned the salute as Kim Jong Un smiled in the background. Diverging from the president, Harry Harris, Trump’s choice to become ambassador to South Korea, said the U.S. must continue to worry about the nuclear threat from North Korea. However, Harris, the former commander of U.S. forces in the Pacific, endorsed Trump’s plan to pause major military exercises with the South, saying the U.S. is in a “dramatically different place” from where it was a year ago. 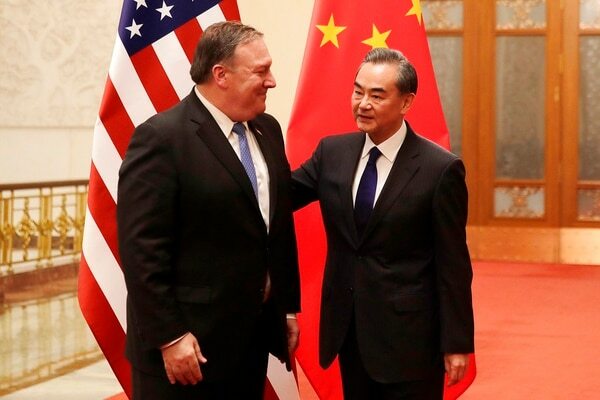 Pompeo flew from Seoul to China’s capital, Beijing, later Thursday for a meeting with President Xi Jinping, whose country is believed to wield considerable influence with North Korea as its chief ally and economic lifeline. 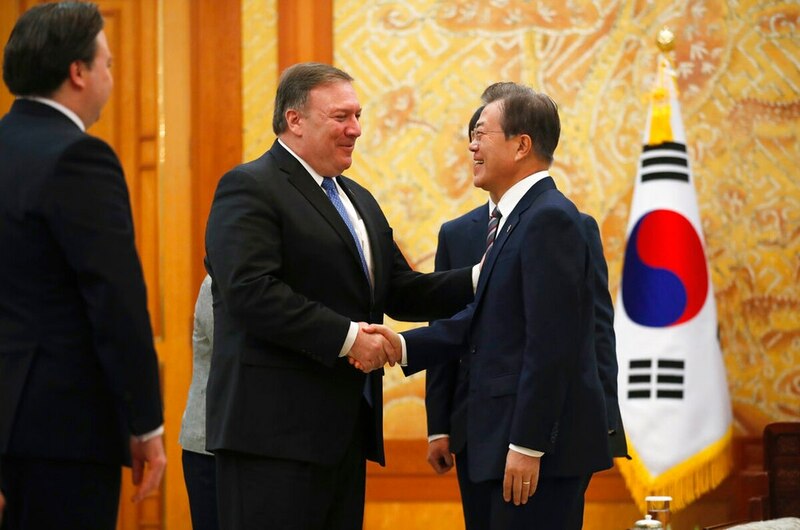 “I also want to thank China and President Xi for his role in helping bring North Korea to the negotiating table,” Pompeo told reporters. Pompeo thanked Beijing for its continuing efforts to help achieve the “complete, verifiable and irreversible denuclearization of North Korea.” He said both sides had agreed that sanctions would not be eased until that’s achieved. Foreign Ministry spokesman Geng Shuang reiterated China’s support for a political settlement, while also pointing to an eventual lifting of U.N. Security Council economic sanctions. For its part, Beijing has broadly welcomed Trump’s diplomacy with Kim. The summit in Singapore marked a reduction in tensions — a sea change from last fall, when North Korea was conducting nuclear and missile tests, and Trump and Kim were trading threats and insults that stoked fears of war. Kim is now promising to work toward a denuclearized Korean Peninsula, and state media heralded the meeting as victorious, with photos of Kim standing side-by-side with Trump splashed across newspapers in Pyongyang. On Thursday, North Koreans finally got a glimpse of video of Trump and Kim together, as official Korean Central Television broadcast the first footage of Kim’s trip to Singapore.